The Premier League deal Amazon just completed in the UK provides for 20 games clustered in two groups of 10 around single weekends. Such a schedule wouldn’t appeal to a broadcaster, but for Amazon, it is just about perfect. Amazon has set its sights on the UK as a country where it can make big strides. The company’s retail business is growing strongly there. Gross sales grew 22% between 2015 and 2016, to reach £20.30 billion ($27.20 billion), or 40% of all UK eCommerce revenue for the year. 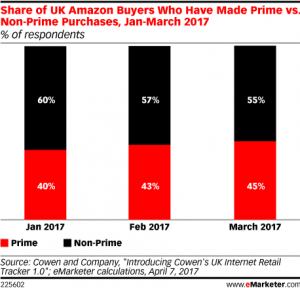 Prime member share of those Amazon sales is also growing strongly. For example, Cowen and Company say that 40% of Amazon buyers made Prime purchases in January 2017. That increased to 45% just three months later. Video is a key tool in driving Prime Membership. When the BBC fired Jeremy Clarkson from the very successful show Top Gear in early 2015, Amazon stepped in. It paid a reported $250 million to lure Jeremy Clarkson and his Top Gear partners Richard Hammond and James May to a 3-year 36-episode deal. The trio’s new show, The Grand Tour, debuted on Amazon Prime Video in November 2016 and, by all accounts has paid off spectacularly for the company. Reuters estimates the show caused 1.5 million to stream video on Amazon for the first time. Many of those first viewers signed up for Prime specifically to watch The Grand Tour. A little math shows why paying so much for the show was a good deal. Amazon paid $83 million for the first season of The Grand Tour. Taking $56 of the $111 paid by the 1.5 million new UK Amazon streamers to join Prime for one year completely covers the first season of the show’s costs. However, the real win for Amazon comes from how much those new subscribers will spend in the Amazon store. Prime members spend twice as much with the retailer as non-Prime members. In other words, spending $250 million on The Grand Tour was a great deal for Amazon. The company is about to repeat the approach, this time using Premier League football. Last week, Amazon closed a deal with the Premier League for the right to stream 20 soccer matches a year for three years. The deal is a UK exclusive, meaning Amazon will be the only place British soccer fans can watch the games. The deal is unusual because the games are clustered in blocks of 10. One block of 10 games will be streamed live in early December. The other ten will stream during another long holiday weekend. Such terms would not have satisfied a broadcast television network. It does little to create regular viewers and boost long-term revenue from advertising and subscriptions. However, it is just about perfect for Amazon. The first ten games come at the height of the holiday shopping season when consumers are only too ready to spend big on gifts for friends and family. Can there be a better time to introduce a consumer to the benefits of Amazon Prime shopping? Suddenly, $120 million doesn’t seem such a high price to pay for a few Premier League games. Amazon has set its sights on boosting its retail presence in the UK. Video is a major part of the company’s strategic plan to achieve greater retail penetration. It achieved solid results with the very expensive The Grand Tour. The company hopes to repeat the performance with 20 Premier League football matches.